It had been a good 15 to 20 years or so since my last trip to Astoria. 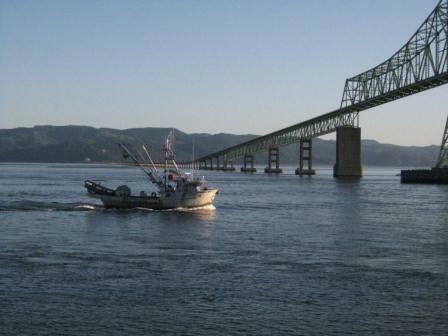 So I was especially happy when an invitation came through from the Oregon Albacore Commission and the Western Fishboat Owners Association to join on an albacore escapade to Astoria last week. Didn’t hurt that I’d recently put my latest cookbook to bed. The prospect of a mini road trip to the ocean coast sounded like just what the doctor ordered after a particularly hectic few months of mostly work and little play. Astoria is a gem of a city, with a unique setting near the mouth of the glorious Columbia River, just a few miles from where the river spills out into the Pacific Ocean. My husband (then just the boyfriend) and I made numerous trips through Astoria, driving Highway 101 from college in Tacoma, Washington to visit his family down in Bay Area. We never drove I-5 those trips, always opting instead for the more leisurely, scenic passage along the coast. Today, the coast has been built up so much I’m not sure it would ever be quite so bucolic as in the past. But for breathtaking views and an appreciation for the part of the world we call home, there’s nothing like a little time on 101. Albacore have been fished in the region for at least a century. In 1899, a group of 7 canneries here banded together to create the Columbia River Packer’s Association that canned salmon being shipped down from Alaska. Come 1910, albacore were found to be in abundant supply right off the Astoria coast–the same year that Bumble Bee became one of the labels developed by the association. 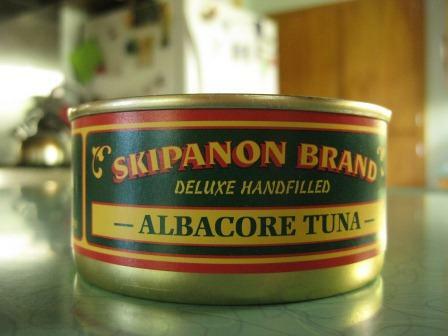 A few decades later more albacore was being canned by Bumble Bee than salmon and they continued to be a major employer in the area until they closed up Astoria operations in 1980 and moved south to California. 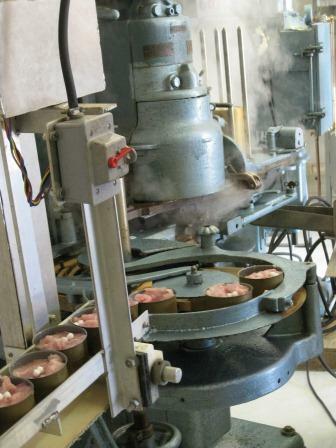 But in that time since Bumble Bee left town, smaller family-owned canneries have been popping up. We visited one, Skipanon, in nearby Warrenton, Oregon. The women at the cutting table were all veterans of Bumble Bee days, skinning, filleting and trimming those fish like they could do it with their eyes closed. 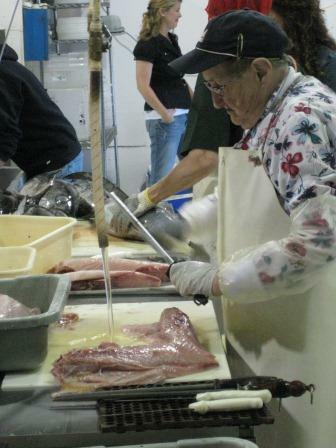 They were handling 800 pounds of albacore that day, all going directly into cans. It was fascinating to see how simple the process. The fillets are cut with a guide that ensures equal can-depth pieces. The pieces hand-packed into cans, topped with a salt pellet or two, then passed through the canner. Which, in the case of Skipanon, is a vintage 1930s machine that still works like a dream. And does its work in a charming, sing-song fashion. I couldn’t help thinking of Willy Wonka when this thing got revved up, with its puffs of steam, jutting arms, rolling wheels, complete with a ‘plop’ in the water at the end. For most of the history of the albacore fishery, the bulk of the catch been going into cans. Not that there’s anything wrong with that, of course. Top-quality fish that’s well handled, hand-cut and packed, processed with no additives or tricks. That’s an amazing product. But the inevitable association of albacore tuna with cans surely doesn’t help the consumer warm up to the fish as a great prospect in fresh form. The flesh is pearly-pale-pink, not deep red. Some albacore are quite lean, so become easily dry and flavorless if not cooked carefully. It’s going to take some tasty enticement to get folks to try albacore with an open mind, and not just because it’s a replacement for the traditionally prized bluefin tuna. We had plenty of opportunity last week to experience just how versatile and delicious albacore is. Dinner was at Clemente’s in downtown Astoria. Chef Gordon Clement is a devoted customer of Bornstein Seafood, which processes local albacore that are prized by buyers in Japan. But the chef makes sure he goes some of that quality fish before it all heads across the Pacific. 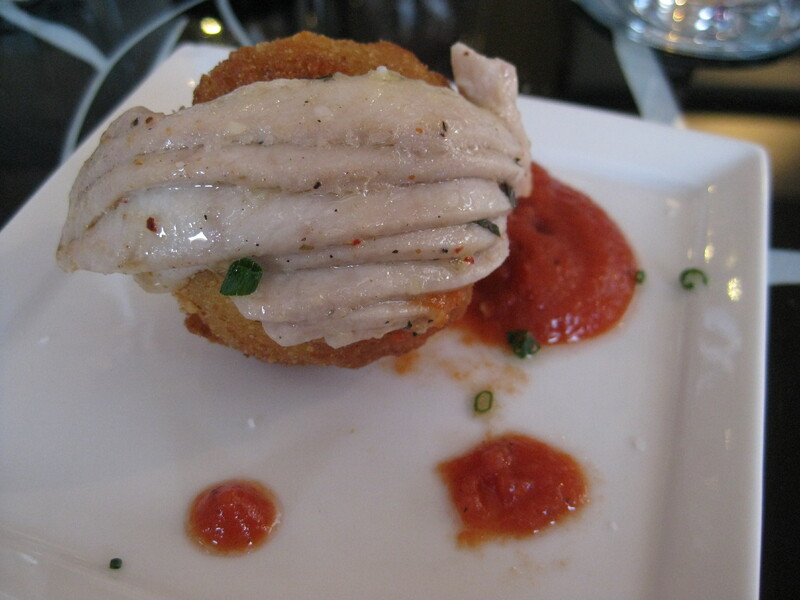 For dinner he prepared a carpaccio with blood orange infused olive oil, shallot and fresh herbs; arancini (a decadent fried ball of risotto, this one speckled with local chanterelles) topped with albacore ‘ventresca’ (belly); and seared albacore loin with quinoa and local squash. The apricot and honey tart for dessert was, thankfully, albacore-free. What a meal! Seeing the fish being caught was about the only thing missing from this itinerary. 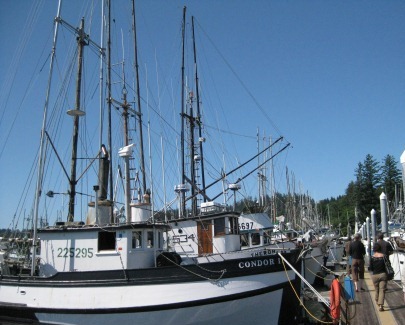 And when I heard that commercial trips out to sea can last up to 2 weeks, I was more than happy for the in-p0rt visit in nearby Ilwaco, Washington that we had with Larry Goché on the Peso II. Pacific albacore are troll-caught, meaning 1 hook per line is set out on arms dropped from the sides of the boat–4 lines per side (on this boat at least)–which helps ensure selective fishing and virtually no by-catch. Fishing nearer the surface of the water means only younger tuna will be caught; older fish–the ones with the riskier levels of mercury by their age–feed lower in the water and aren’t interested in these lures. And the pace at which the boat motors with those hooks trailing behind is just zippy enough to let the tuna catch up, but faster than a salmon will likely chase after a lure, helping ensure little cross-species catch. Fish are hauled in one by one (a bell attached to each line alerts when a fish takes the bait) and quickly bled, then chilled in a super-cold brine (4 degrees F) before being transferred to the hold. A couple good weeks of fishing can bring in up to 11 tons of fish, their hold’s capacity. I sure came home with a new appreciation for local albacore. It was interesting that, for this fishery, young fish are considered more sustainable than older fish, which are left to be brood stock for future generations. Called “peanuts,” they are in the 15 to 20 pound range where mature fish can get up to 75 or 80 pounds. I was also surprised to hear that as much as 80% of the local albacore sold in fresh form goes to very grateful buyers in Asia and Europe. They clearly know something that American consumers have yet to understand: how much albacore tuna has to offer. Not just as a convenient canned product or a conscience-friendly fish option. But as a healthful, affordable, sustainable seafood that’s as worthy a star on our dinner plates as anything that comes from the sea. Oh, and the ale in Astoria? Yep, they have some of that too. 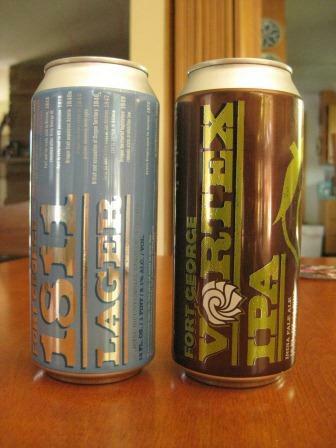 We were introduced to brews from downtown Astoria’s Fort George Brewery with our lunch the next day. We sipped the 1811 lager, named for the year the city was founded. In fact this beer was the “official bicentennial beer” for festivities this year. Made in a pre-prohibition style, both malted barley and cracked corn are employed as the grain base. Back then, malted barley wasn’t as easy to come by in the region and corn was a popular beer ingredient. We also tried the Quick Wit, a Belgian-style beer embellished with flavor from lemongrass, coriander and elderflower. Finally, the Cavatica Stout, richly flavored but not at all heavy, a delightful sip to cap off the meal. Cans. I came home from Astoria with a lot of cans. Not only was I gifted with a handful of cans of the local albacore catch from a few different producers, but I stopped by Fort George on the way home and picked up a couple 4-packs of their canned delights. Pretty much all the beer that’s not drunk from the tap goes into cans, not bottles. The only beer they bottle each year is their special holiday ale, “The North.” As head brewer Spencer Gotter pointed out, cans rock for a few reasons: the seal’s tigher for less chance of oxidation; lighter weight for less costly shipping; metal cools more efficiently than glass; it’s safer at beaches and poolside; and you can’t target practice (as well) with a beer bottle. I’m sold. The 1811 and Vortex IPA I brought home have proved the point in tasty style. In fact, just to be sure I partook of a can of 1811 whilst writing this post, for journalistic research value. I won’t let so much time go by before a return visit to Astoria. The history, northwest culture, seafaring past, contemporary eats and drinks, stunning river- and ocean-side setting. Standing at my balcony in the Cannery Pier Hotel with the Highway 101 bridge jutting across the river and an endless parade of fishing boats, tugs and other craft going by…..it’s a view of the Northwest I could never tire of.